I got rid of my Instagram account (and Facebook account) some time ago, but I’d still like to see photos from my wife and our dog, without being tracked or gamified into addiction. To do that, I was just visiting the Instagram website for each public user I wanted to view, but that was way too much work. So I built noinstagram one Sunday. All the noinstagram code does is scrape the public accounts of the users I want to see, then builds a webpage, and puts it on GitHub Pages. It uses instagram-php-scraper for the “data collection”, Bulma for some basic CSS styling, and CircleCI for building and committing the page back to GitHub. We’ll see if Instagram allows this to stay up. 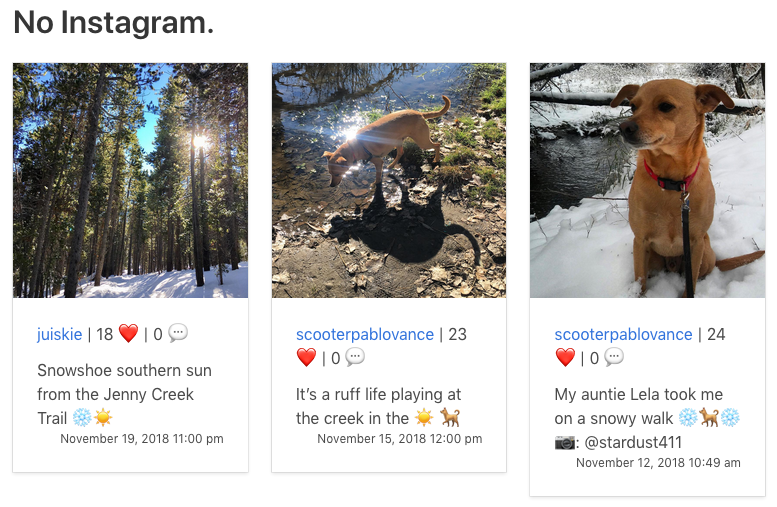 I’ve received “Cease and Desist” letters before from corporate-type entities when scraping their sites, but these photos aren’t Instagram’s property … are they? Anyway, if you want to delete your own Instagram account but still see what your friends and family are up to, you can run your own version of noinstagram. Just follow the instructions in the Readme on GitHub, and hit me up with any questions.